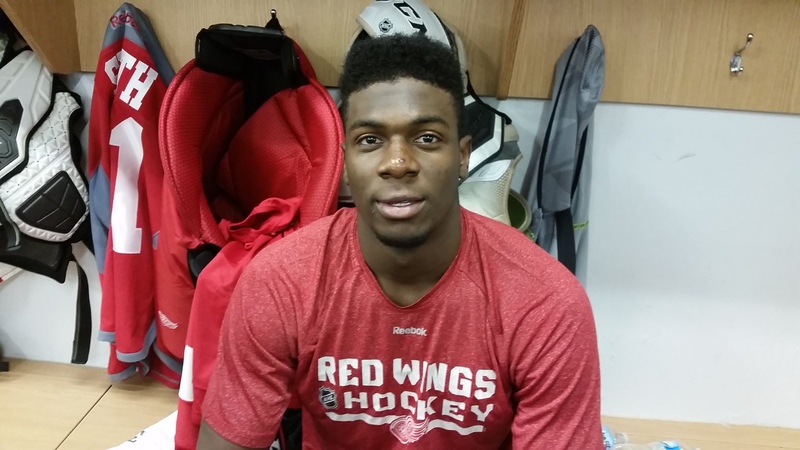 The Detroit Red Wings’ annual prospect development camp is underway in Traverse City, Michigan this week. The camp includes a mix of draft picks, signed free agents and invited players. Describe the emotions being drafted by Detroit. It was definitely a real exciting time, being with all my family. To be drafted into a team with such great history, you know, an Original Six team with so much tradition. And to be a part of it and to be at this camp, it’s pretty special. Did it help having an older brother who’s already gone through the draft process, to know what to expect? Yeah, absolutely. Gemel helped me so much, even with the OHL draft, and minor hockey, and especially in the NHL draft and the combine and everything that’s happened the past month. He’s really guided me and helped me get through everything. Did he give you any advice going into the draft? Yeah, he told me, like you’re going to be nervous, so just try to overcome that. And just don’t try to be someone you’re not. Be the player that I am and, that’s why I got here, and not to change anything. You get a lot of penalty minutes, but you also score goals and assists as well. I’m sure you get your fair share of Gordie Howe hat tricks? Oh yeah, I actually had two this year. So it was pretty cool, you know, getting the fight, goal, and assist. All the guys loved it, coach was joking around with me about it. That’s my type of hat trick (laughs). What was the transition like from minor midget to the Ontario Hockey League? Oh it was great, I loved it. Me being a bigger guy and playing with bigger guys, it was good. I obviously went through some adversity, you know, getting up to the speed of the game, making faster transitions. It was good. I got comfortable after about the first half and started playing a lot better in my 16-year old year. What made you want to get into hockey? Did it run in the family? Yes it did. My older brothers, they all play. My dad and my uncles, they didn’t play ice hockey, but they played a lot of ball hockey, so they kind of brought us into the game and we just liked playing it. Who were some of your hockey inspirations? For me when I was younger, I liked watching guys like Ovechkin and Crosby, but as I got older I started really watching guys that play similar to me, like Wayne Simmonds and Abdelkader from Detroit, and P.K. Subban and those guys and how they are both on the ice and off the ice. It’s pretty cool. That’s how I want to be in the NHL. Describe your style of play. What are some of your strengths? Just overall, I’m a physical guy, I like using the body. I got a good shot coming down the wing. I really like taking pucks to the net. I got a little creativity down low to find guys open and to keep plays going. Do you feel like you bring an element that Detroit’s been looking for for a long time? Yeah, Detroit, they’re looking for a physical role guy with some of their previous players getting older. So it’s nice being in the system, you got me, Tyler Bertuzzi, and guys that play the game pretty hard and pretty aggressive. You know, I can finish checks and I’m not afraid to get dirty. It’s pretty good to be here and to get this opportunity in Detroit. Yeah he gave me a lot of good advice. Since I’ve seen him at the airport, it’s made the first couple of days [here] feel more comfortable for me. And to make it be more relaxing instead of me being so tensed up and not knowing some of the guys. You know, he took me under his wing and introduced me to the other guys that are here that he knows. So he really did a good job making me feel comfortable. Is there a particular part of your game that you feel needs a little bit of work during the off-season? Yes, I need to work on my agility. That’s what I’m working on a lot this summer to get better for next season. What do you hope to accomplish next season? Next season, hopefully I crack the Detroit Red Wings roster, but if not, to go back to the Guelph Storm and take what I’ve learned from the coaching staff [here], the skills and development coaches and have a good year, and then come back here for the development camp and main camp and try to make the team. Does seeing a guy like Dylan Larkin come in and make the lineup out of training camp last year give you that incentive and that push to know that it’s possible to make a good enough impression? Oh yeah absolutely. You know, Larkin definitely opened up a big door for that, you know, making the team as a 19-year old, that’s pretty special. I’m confident in my abilities and I’m really pushing myself to make the team this year or next year. Besides being drafted, what’s been your favorite hockey memory throughout your life? Um, favorite hockey memory was when I was playing with the Mississauga Senators minor hockey, my whole team went to a tournament in Chatham (Ontario) and we stayed in this hotel with roller coasters and go-karts and a nice pool. It was just fun at that age. That’s a memory that I’ll never forget.